For over 40 years, Keson fiberglass measuring tapes have met the highest standards of accuracy for quality measurements. They resist breakage and damage under the toughest field conditions. We understand that these tapes are critical to your profession. That’s something we take very seriously, and that is why we supply the best possible tapes we can. We cover each blade with two coats of PVC protected by double shield, one to bind the fiberglass strands and a second over the printed units, so the numbers don’t wear away. Keson fiberglass reinforced tapes are designed to withstand more wear and tear than any other type of fiberglass measuring tape. They contain 40,000 fiberglass strands for greater tensile strength and superior accuracy when tension is applied. Two coats of PVC protect the tapes from breaking, and a blade shield adds strength to the attachment (the point at which most fiberglass tapes break). These tapes have proven dielectric strength of 200,000 V/M to assure your safety from electrical hazards. The weight of a tape is a factor to consider if you do a great deal of measuring. With our heavy-duty fiberglass tapes, we pack the strongest possible fibers — and the greatest number — into the thinnest possible tapes to keep the weights down while keeping the blades strong. 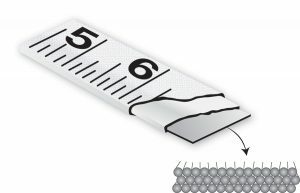 Tapes elongate (stretch) when excessive pulling force is applied. Keson heavy-duty fiberglass always returns to its proper length after the pulling stops. The reason is our high fiberglass strand count. To keep your fiberglass measurements as accurate as possible, don’t pull too hard when making your measurements. We have designed a variety of housing types for our customers: Freewheeling Long Tape (FLT), 3X High-Speed Rewind (OTRS) and Standard 1X Rewind (OTR). Double riveted or screwed cases, metal reinforced handles and shovel-style, rubber grips are standard on all of our offerings. 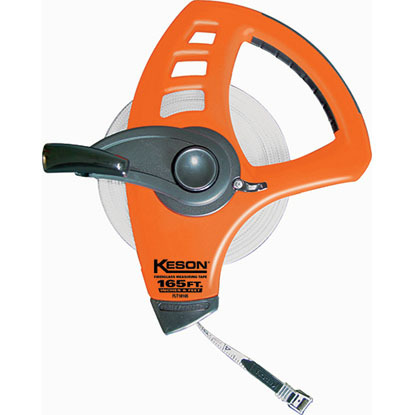 Keson offers the widest product selection of fiberglass blades. Units, attachments and zero points vary because of the precise needs of our many customers. 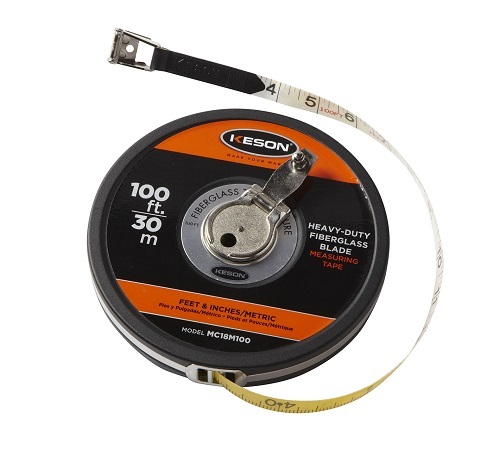 Keson fiberglass tape measure refills are exact replacements. They are manufactured with the same stringent standards and specifications as the original tapes in our open reel cases. Replacement blades are available for most of the tapes. Replace the category letters with “RF” (for ReFill) and use the same blade number. E.G. 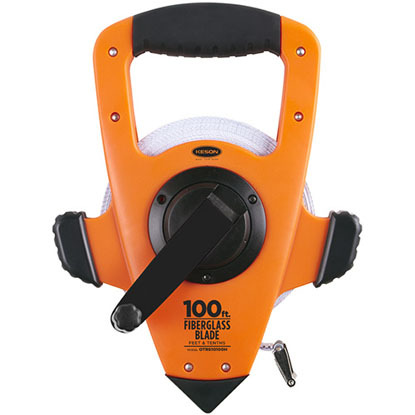 an OTR10300 replacement blade is RF10300. 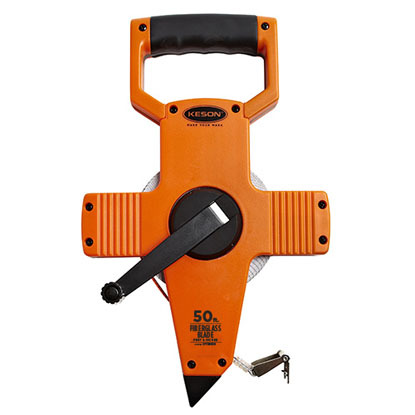 Ergonomically designed housing handle with tactile rubber grip for balance and comfort. The 3X high-speed rewind gearing is made up of metal, strip-proof gearing. These long, fiberglass tapes have a compact, closed metal case that fits nicely in your hand.